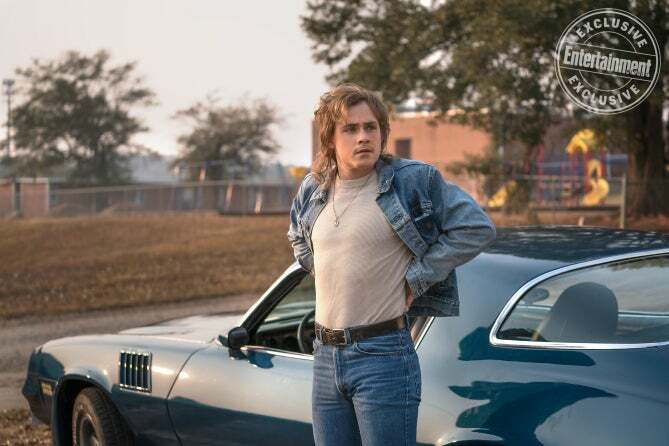 Dacre Montgomery is trading in his Power Rangers suit for lots of denim in this first shot from Stranger Things season 2. Montgomery played the role of Jason the Red Ranger in the recent Power Rangers live-action reboot, but he's taking on the name of Billy for his role in Stranger Things. The first shot of him from the new season shows Montgomery standing next to his sleek ride in a denim jacket and blue jeans with a tan shirt, though you'll probably take note of the long hair more than anything (via EW). Montgomery's character in Power Rangers was a cleanly-shaven star quarterback, so this role is certainly a big departure in the looks department. It's also polar opposite when it comes to personality. Sure Jason was a rebel in some ways (he did try and steal a cow from the opposing team) but Billy is much more of an antagonist in Stranger Things. Billy is prone to big mood swings and violent behavior, which fits what the team was looking for when they brought him on. The Duffers wanted to have human characters that could be looked at as worse than the more supernatural phenomena that exist on the show. You can view the new photo above. While Billy will be an obstacle in the group's way, he isn't the biggest enemy they will face. That falls to what is being described as the shadow monster, which Stranger Things creators Ross and Matt Duffer tease will eclipse Billy and the first season's adversary in huge ways. Suffice it to say, whether in the air or on the ground, the threats are coming from everywhere next season.